The renowned Art Law scholar has died at age 95. Goldstein, of Herrick Feinstein, was council to the Commission for Art Recovery. Dr Mertz was an Egyptologist, a best-selling author, and an advocate against the trafficking of Egyptian antiquities. The books appear to have been taken from the Lawyers Syndicate and were on their way to Kuwait. Nazlet Khater man, a Paleolithic skeleton held in Belgium since 1980, was returned as it left the country before a 1983 law that would have allowed Leuven University to perhaps keep it. In light of recent historic church thefts, Minister of Culture Marko Machicao Bankovic says that teams are investigating. Because no evidence has been found against the only suspects. The 18 items stolen from Bolivia’s most holy site have not been recovered. Two of artist Maryanne Jesperson’s paintings were stolen from a show in Calgary. Oreros as Huaqueros. Accusations that gold panners have found, looted, and destroyed archaeological sites in Puerto Jimenez de Golfito, Puntarenas. A chalice, a ciborium and other items were taken from this historic church which is currently being restored. Lamenting the poor preservation status of and theft from historic churches in Coacoatzintla, Veracruz. Inhabitents of Pánuco say that the INAH is not taking precautions to protect sacred art during restoration to the historic Temple of San Juan Bautista. They also fear that objects will be stolen. Residents of Tehuipango, Veracruz have accused a priest of stealing a gold sacred image. The Church claims the patron saint isn’t stolen, just removed so it can be copied…and that it isn’t made of gold. An excerpt from Amore’s new book. A US District Court judge determined that Poland lacks probable cause to have dealer Alexander Khochinskiy extradited for selling a painting taken from a Polish museum during WWII. This sort of metal theft really hits communities hard: people work for commemoration and then, gone. The case for returning Kennewick Man. The 20 year saga of Kennewick man continues with the ‘S. 1979, the Bring the Ancient One Home Act of 2015’. A republican US Representative adding to democrat senator Patty Murry’s call for return. The man made an obscene gesture at a security camera then stole a gun and a tomahawk from the Old Idaho Penitentiary Site museum. The stolen items were left at the police department. Result! The Tennessee man was given 30 months in federal prison for digging up shells on federal land at Fort McCook at Battle Creek and at Shiloh National Military Park. The difficult balance between enthusiasts, armchair historians, and preservation when it comes to battlefield sites. Is there a Nazi stamp on the back?! The continued fight over a Pissarro in Fred Jones Jr. Art Museum at the University of Oklahoma considered to be Nazi-looted art…again. Oklahoma University continues to state that statements that their Pissarro is Nazi-looted are misleading. Fisher has died and his ‘salvage’ loot is going on the block. A sad reminder about the inadequacies of the law of the sea and what we all lose because of people like him. This is looting. Mark M. Beatty bought the remains of 8 people as well as artefacts from an Ohio farm. He was prosecuted under NAGPRA. He gets…three years of probation, including three months of house arrest; a $3,500 fine; and $1,000 in restitution. So pretty much nothing. They were taken from Montana’s Crow reservation and sold by dealers between 1970 and 1990 then donated to the museum in 2004. University of Missouri Archaeologist R. Lee Lyman has been charged with removing artefacts from Umatilla National Forest without a permit as is a doctoral candidate and a researcher affiliated with Southern Methodist University. More on this story. I am so angry at these people I could spit. They make us all look bad. Portable public art is, of course, being stolen. These signs are being taken from Manhattan street poles despite all efforts. “New” it isn’t; it is unclear why this video wasn’t released 25 years ago when someone could have made an ID. The man in it appears too old to be alive now. More on this story, which puts a lot of heat on the guards. After 25 years, that isn’t surprising. The whole Gardner everything is weird and a mess. Bob Casey is talking about creating a chilling effect and really equating antiquities buying with ‘terrorism’. Great, but I am not seeing how this bill will do that. Rockwell painted 3 paintings with the Ticonderoga No. 2 pencil in them. All three were stolen, one was recovered, two are still missing. The company is hoping that a new museum will prompt their return. Forrest Mars Jr got Mars to invest $16 million for a new building for the Brinton Museum in Montana and a major sacred collection was purchased to go there which is being curated and exhibited with a Native American advisory council. Researchers are doing tests to see if this famous statue was replaced with a fake in the 19th century (with the original in the Brussels Museum). The 14th century Madonna of Veveri, which was confiscated under the communist regime, will be returned to the Catholic Church. Slovakia isn’t saying the Getty did anything wrong, rather they are investigating why the bust was severely under valued in Slovakia so that it was allowed to leave that country. It was sold for only €24k Euro in 2014. The Getty bought it for $33mil. The painting, declared a national treasure, was barred from leaving Spain but was seized on a yacht docked in Corsica. The yacht may have been purchased specifically to smuggle the painting. Donald Smith and Emma Poole of Opus Art gallery in Stow-on-the-Wold have allegedly run up debts, sold art that was never delivered, and fled to France with other people’s art in tow. The older-than-the-16th-century stone had been smashed and thrown into water. Thanks to the help of volunteers the museum was able to open after cash and artefacts valued at £10k were stolen last week. They did so inched from Viking graffiti. This is infuriating. Would-be grave robbers forced open the wood floor hatch that covers the saint’s burial site during a 15 minute window but there were no visible remains to steal. The city will pay heirs for a tapestry that was subject to a Nazi forced sale in exchange for the family of Emma Budge relinquishing of the claim to the piece. The artwork by Kurt Schwitters was taken from a barn in the Lake District and turned up with a man trying to sell it at Bonhams. Lots of arrests, but serious understaffing for looting prevention and other security measures. Thieves stole a face, bell, and 4 flags, all made of silver, from Laxmi Venkatraman temple on Kundapur-Kollur highway in Vandse. This is from centrally-protected museums and monuments over the span of a year. A panchaloha Krishna was taken from the Anandawalleshwaram Sree Mahadevar temple in Kerala. The idol was over 400 years old. The pond of the Anandawalleshwaram temple in Kollam was drained in hope of finding an idol that was stolen this weekend. Water bodies are suspected because of the results of a devaprashnam, or divining ritual. The man was arrested for carrying out thefts in more than 30 temples and churches. Mostly of money but also of gold ornaments and other sacred items. A general audit found many items missing from the Williamson Sangma Museum in Shillong. Even though the December 2014 theft was solved in January 2015, and even though there was a lot of publicity over the two police forces collaborating, with no extradition treaty the accused idol thief is still in Nepal. Not a surprise, but good to hear the Federal Minister for Information and National Heritage saying this very publically. A call for instilling pride in Pakistanis about their ancient monuments in hopes of protecting them from looting. Profile of artist Morehshin Allahyari who is using 3D printing to recreate artefacts that have been destroyed or are at risk. “Idolatry needs to be destroyed.” Benzion Gopshtein later said he was not calling for individuals to take matters into their own hands, rather it should be the responsibility of the government. Snow didn’t have a permit to take 399 pieces of Majdal Nateel’s work out of Gaza for a London show…but did. Nateel was not able to leave, however. The big must read. Very careful reporting and significant work. Photos of antiquities and fakes from a middleman’s mobile with comments from top archaeologists. More from the BuzzFeed article. Featuring Sam Hardy’s ‘super-long shot’ call to ID archaeology books seized from ISIS from a photo alone and how folks are ‘really’ studying Iraq/Syria looting at the moment: mostly from afar. I am not sure any of the academics involved would say either ‘outracing’ or ‘outwitting’ (correct me if I’m wrong, y’all), but it is a composite article made of other articles. The now-famous Tetrapodophis amplectus, which Science happily published, seems to have left Brazil illegally and was borrowed from a German private collection. More on this story, Brazil’s laws on this are solid and date to 1942. No govt permission, the walking snake is stolen and illicit. The quotes from the scientist involved are horrific. He’s not above the law, but he sure thinks he is. The fossils were reportedly unearthed at a construction site in Heyuan but not reported to authorities. The women, who filmed themselves ‘red dresses gyrating to music’ inside the temple of Wat Chaiwatthanaram are charged with a violation of the Ancient Monuments act for insulting religion and/or culture. The UK’s visa denial letter accused Ai of having not declared a conviction in China which they stated was a matter of public record. Ai has never been charged or convicted of a crime. Yes, UK immigration really is this terrible/broken. With about 100 letter boxes stolen every year, the Royal Mail is turning to electronic tracking and other tools. 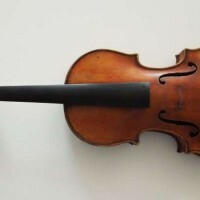 Stolen in 1980, the Ames Stradivarius surfaced when a woman had it appraised in New York City. The appraiser called the police but the woman is not accused of any wrong doing.